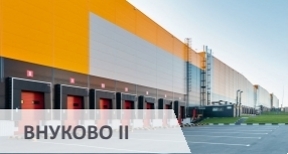 Nakhabino II logistics complex is a modern Class A warehouse complex consisting of 4 building facilities with total area of over 72,000 sq.m. 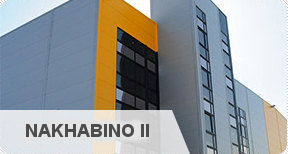 Considering the walking proximity to Nakhabino I logistics complex, it was decided to continue the numbering of facilities from the existing one. - the technical equipment of the complex certainly includes the system of steam fire protection, automatic fire alarm with laser indicators, alerting system, finish covering of all metal structures with fire-retardant paint, smoke extraction system. -high-quality finishing of offices, equipped with systems of inflow-exhaust ventilation and air-conditioning, finishing materials of escape routes from office premises are non-combustible, all doors in premises are made in Germany by Hormann. On May 2, 2013, the first column on the 9th facility was mounted, and on January 14, 2014, the whole facility was already handed over to the tenant. In March 2014 the 8th facility was handed over to the tenant. 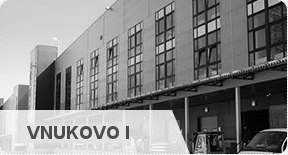 In August 2014, the 7th facility was sold to Exist company, leader of the Russian market of the spare car parts. 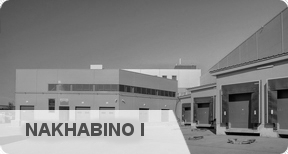 In September 2014, the 6th facility was handed over to the tenant.